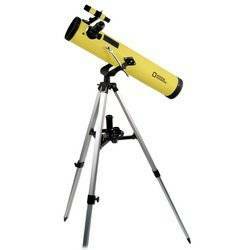 I got my first telescope, an Orion XT6 dob , back in October of 2007. It wasn’t an impulse buy – I had spent almost exactly one month reading the telescope recommendations in books and magazines, on Cloudy Nights, and on countless other webpages, including Ed Ting’s amazing scopereviews.com. Inevitably during this time of rapid, omnivorous consumption of all available telescopic information, I came across many websites that dealt with amateur telescope making (ATMing). Even more interestingly, I found that lots of folks had built little scopes, mostly reflectors, that could fit in a carry-on bag for airline travel. Probably the most exciting to me was Bob Bunge’s 4.25-inch f/4 reflector, which he named “Pringles” – exciting because it looked like something I could actually build. Although I have not to date built any scopes along those specific lines, Bunge’s little scope showed that it was possible to get good, useful results from a fairly humble structure. I should mention that I was fascinated with airline-transportable telescopes mostly because I was living in Merced at the time, in California’s central valley. It was a fairly depressing place to be a stargazer. The central valley is ringed by mountains and in the summer, smog from vehicle traffic and dust from agricultural work just pile up in the atmosphere. I actually experienced worse smog in Merced than I do here on the edge of the LA basin. (It didn’t help that the only astronomy club within 50 miles of Merced had gone defunct a year or two before I got there.) Anyway, Vicki and I grew up in Oklahoma and that’s where most of our extended family lives, so we go back to visit once or twice a year. I was really keen to get out under dark Oklahoma skies with a telescope, but I figured it would have to be a telescope I took with me. So that’s me in the autumn of 2007: mad about telescopes, unhappy with my skies, interested in building something airline-transportable. Then one day I was following London through the toy section of a department store and saw a 3-inch National Geographic branded reflector telescope on sale for about forty bucks. I’d seen a lot of travelscopes in that aperture range online, so I bit. I did at least try to use the scope as sold. It was a decidedly mixed bag: the tripod was actually fairly sturdy, and the 6×30 finder, although 100% plastic (even the optics), actually worked. But the whole thing went to hell in the last four inches of the light path. The 0.965-inch plastic focuser was the roughed rack-and-pinion unit I’ve ever used – trying to focus was like driving down a washboarded country road in an old pickup with no suspension. The drawtube was so loose that when it was racked out you could move it from side to side by almost half a centimeter. The final insult, though, is that to make the plastic focuser look like metal they painted it silver – inside and out. That meant that when you looked through the focuser you get all kinds of horrible reflections from inside the focuser drawtube! With an insane amount of effort, one could get something into the field of view, only to be rewarded with the mushiest, most chromatically-aberrated views I have ever seen in a Newtonian, which I blamed (correctly, as it turned out) on the beyond-crappy, entirely-plastic eyepieces. Now I understood why every piece of advice for beginning astronomers included a warning about department store trash scopes. Shame on National Geographic for lending their imprimatur to such an unusable instrument, which was good for only two things: making newcomers hate astronomy, and spare parts. I promptly disassembled mine. Here’s the v1 test rig I lashed together as a proof-of-concept. 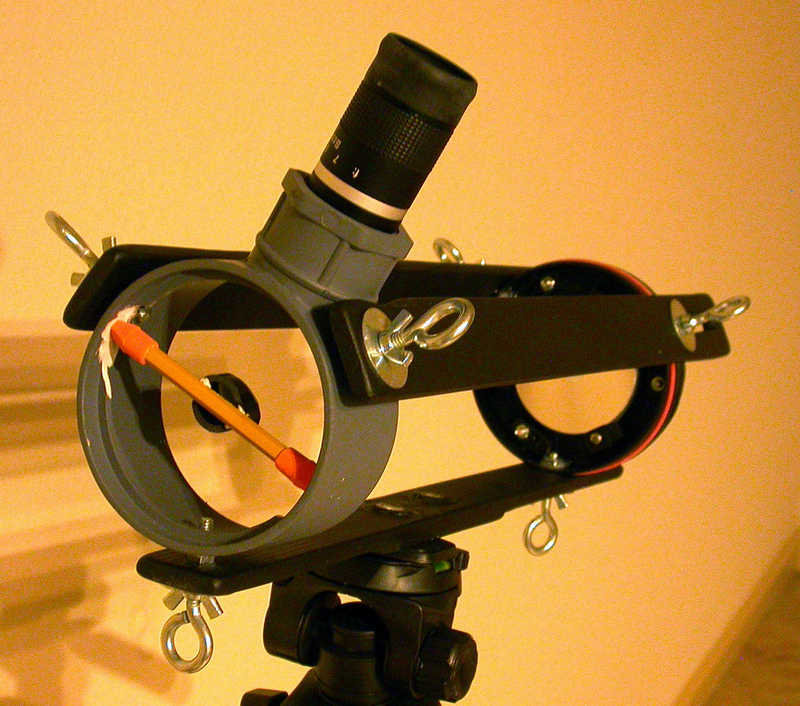 The scope is held onto a tripod by a 1/4-20 T-nut embedded in the bottom strut. The helical focuser is made from plumbing parts, which are stuck to the upper tube assembly (another plumbing fitting) with Automotive Goop . Here’s the v2 incarnation. I shortened the upper tube assembly and painted the whole thing. The grooves at the back of the struts are so I could slide the mirror back and forth to get in the neighborhood of focus, then touch up with the helical focuser. That also meant I had to recollimate, but I had to do that anyway. Lots of things require explanation in this picture. First, my super-simple all-axis adjustable spider is just a pencil with an eraser on either end, wedged into the upper tube assembly. There’s a ridge inside the UTA right where the erasers needed to bite, so I ground it down with a Dremel. But I only discovered that after I painted everything, which is why there is a patch of bare white plastic showing. The back end of the scope is the metal-and-plastic mirror cell from the original scope, complete with spring-loaded collimation screws. I had removed the mirror, drilled three equidistant holes in the side of the mirror cell, and glued in 1/4-20 nuts for the eyehooks to thread into. The red rubber band around the mirror cell was to give the struts a bigger, no-slip contact patch. At the front end, you can just make out an extra 1/4-20 nut between the bottom strut and the UTA. I actually had one of these inboard of each strut, because the UTA was slightly smaller than the mirror cell and I needed the nuts as spacers to keep the struts straight. Finally, there is simply a boatload of hardware here: 6 eyebolts, 6 thumbscrews, 6 washers, 3 extra nuts up front…gah. Here’s the scope in its final – or at least current – version. The first simplification was to go from three struts down to two. Second was to realize that since I was collimating by sliding and rotating the mirror cell anyway, I could ditch the oversized original mirror cell and just stick the primary mirror in a drain endcap that would match the diameter of the UTA. Third was to realize that I could get by with a lot less hardware: just 4 thumbscrews and 4 washers for a total of 8 bits, and I could even glue on the front washers if I was so motivated. 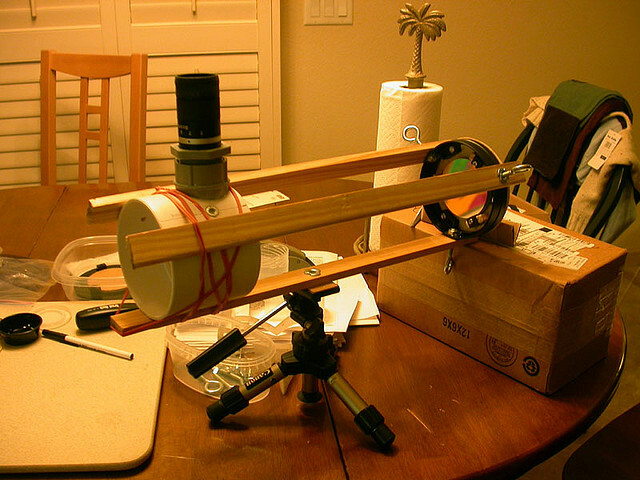 And the wooden struts are even the right width to fit into a Vixen-style dovetail, so I can attach the scope to an astronomical tripod with no extra parts, although one strut is still threaded with T-nuts for attaching to a camera tripod (you can see it mounted that way in this post, in a photo from 2008!). Still rocking the pencil spider. I should at least paint that thing black. So, how does it work? Surprisingly well, given that there’s almost nothing to it. I had it out last night for a quick spin around the sky, and took in the Pleiades, the Ring Nebula, Albireo, the Double Cluster, and Stock 2. None were spectacular, but all were recognizable. I’ve never rigged a shroud, so scattered stray light definitely gets into the mirrors and eyepiece and cuts down the contrast, which isn’t good since the scope gathers so little light to begin with. I actually got a noticeable improvement in contrast just by cupping my hands above the mirror cell. I should really make a decent shroud and give this odd little duck a fair shake. I’ve only used it a handful of times, always more for testing than for actual observing, and I’ve never flown with it, so it’s never gotten to serve its intended purpose. On the plus side, in addition to throwing up an acceptable image, it makes a great model for demonstrating the principles of a Newtonian reflector. And it’s still the only complete telescope (minus the optics) that I’ve built from the ground up on my own. The main legacy of this scope was to convince me that I was a telescope user, not a telescope maker. That may change someday – I do tackle the odd DIY project here and there – but it was definitely the right decision in my first year as an amateur astronomer. I know what you mean about being a telescope user rather than a maker; my time is limited, and while it’s fun to imagine doing the work, mostly I’m pretty happy paying the good folks in the factory to do the work for me. *Blush* Many thanks for the kind words. 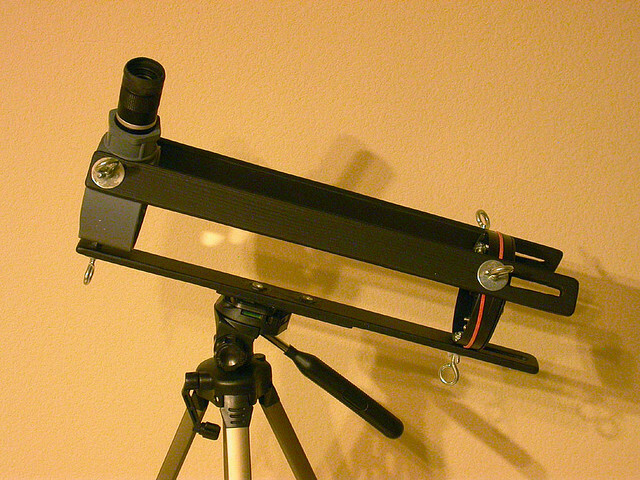 If you’d like to see something similar executed at a non-caveman level of craftsmanship, check out Gary Seronik’s converted StarBlast, which is not only better-looking than my travelscope but actually simpler, since it uses only a single, sturdier strut. 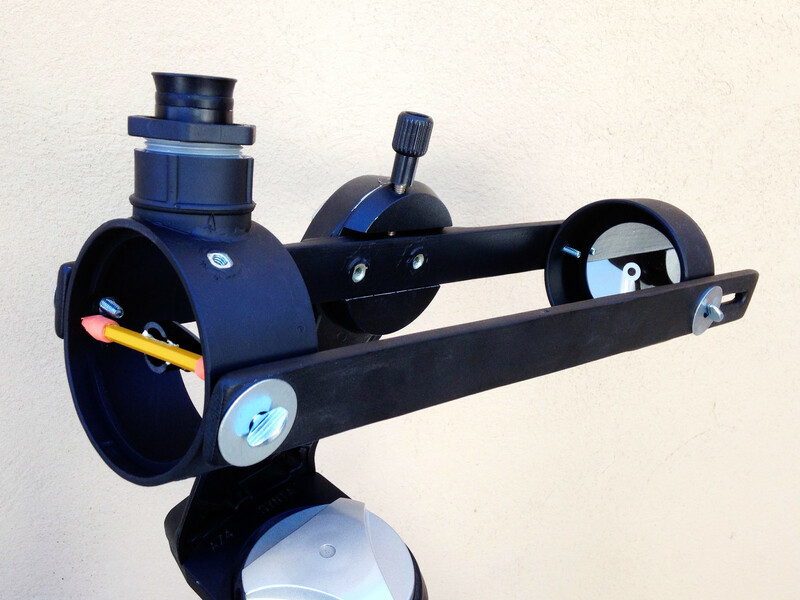 I have experienced just enough satisfaction from hacking on these projects to imagine that in a few years I might set up a small woodworking shop and start attempting to build real telescopes. But I’m going to have to work up to that. Anyway, thanks again for the kind words, they made my day. very nice work! like such things!